We love our flat-panel TVs, but we don't always love the paltry speakers with which they're equipped. Sometimes, underwhelming sound quality is the trade-off we have to make for sleeker and slimmer television cabinets. Luckily, this is a trade-off we can easily remedy. 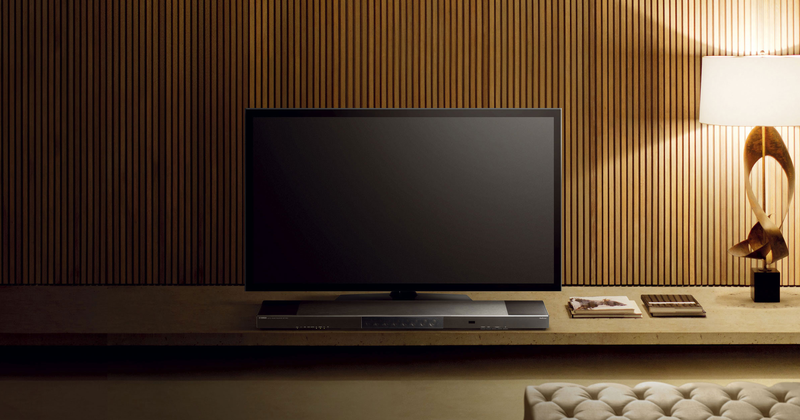 The simplest way to upgrade your TV’s sound reproduction is to couple it with a soundbar. When pairing your flat-panel TV with a soundbar as capable as Yamaha’s MusicCast YSP-1600, you will be gaining much more than just intelligible audio. With a built-in multi-channel speaker array powered by an internal 80-watt amplifier, this soundbar is ready to bring your movies and music to life in a way that few built-in TV speakers can match. While soundbars aren’t typically known for their multi-channel audio capabilities, Yamaha aims to buck that notion by outfitting the MusicCast YSP-1600 with eight 1.1" beam drivers and two upward-facing 3.25" subwoofers for added bass impact. The integrated beam speakers utilize Yamaha’s Digital Sound Projector technology to help simulate a surround-sound experience, by reflecting sound from surrounding walls. The aforementioned dual-subwoofer design is nicely complemented with bass reflex ports to enhance its low-frequency sound output. To accommodate the various types of audio sources you may be enjoying, this soundbar generously offers Movie, Music, Sports, Game, and TV Cinema DSP modes. As the MusicCast name implies, the YSP-1600 offers a bevy of music streaming options. Starting with Wi-Fi and Ethernet connectivity, this soundbar enables you to access your digital music library, streaming music services, and Internet radio sources. Furthermore, you can enjoy convenient control using the free MusicCast Controller app for Android and iOS smart devices. If you have other MusicCast-enabled devices in your home, such as receivers or wireless speakers, the app allows you to configure multi-room listening and enjoy simplified control. This is a great feature for those who wish to fill multiple rooms with music. Bluetooth and AirPlay are also available on this soundbar, which broadens your wireless streaming options even further by allowing you to pair it with a wide variety of similarly equipped audio sources like smartphones, tablets, and computers. This soundbar’s Bluetooth implementation doesn’t just stop at music streaming. Its Bluetooth output connectivity gives you the ability to connect a pair of Bluetooth-enabled headphones for those times private listening is required. Bluetooth standby mode is also available if you want to turn the speaker on and off using Bluetooth connectivity. If you are pairing the YSP-1600 with a high-definition TV, you probably have at least one high-definition source component, whether it’s a set-top box, Blu-ray player, or streaming media device. This soundbar’s HDMI input accepts video signals up to 4K for outputting to your connected display, also accomplished via HDMI. Your wired audio sources are also welcome, thanks to the YSP-1600’s onboard digital optical and 3.5mm audio inputs. It’s clear that Yamaha wants you to be able to attach nearly any audio source to the YSP-1600. Do you remember those built-in subwoofers we mentioned earlier? Well, in case that isn’t enough for you, the YSP-1600 offers a subwoofer output, which allows you to connect external powered subwoofers for even greater low-frequency handling. At this point, I hope we have outlined the many ways this soundbar can serve as a noticeable step-up in sound quality and functionality over your TV’s built-in audio capabilities. If its 80 watts of power output isn’t enough to make you do a double-take, its smart device integration and wireless connectivity are certainly attention grabbing. A 39.4" wide, the YSP-1600 can be placed alongside flat-panel TVs of various sizes. It can even be wall mounted, and includes two mounting brackets and a mounting template. While there are a lot of soundbars on the market, the YSP-1600 offers a compelling mix of power, connectivity, and simplicity, and deserves to be on the short list for soundbar shoppers who prioritize multi-channel audio handling and expandability.